An eight-pointed star, the uppermost point displaced by a crown, on the star a circle inscribed The Devonshire Regiment. Within the circle the Castle of Exeter above a scroll inscribed with the motto Semper Fidelis (Always faithful). 2nd Bn 1909–1912. The Devonshire Regiment was raised in 1685 by the Duke of Beaufort for the suppression of the Monmouth Rebellion. It was numbered 11th Foot in 1747, to which North Devonshire was added in 1782. 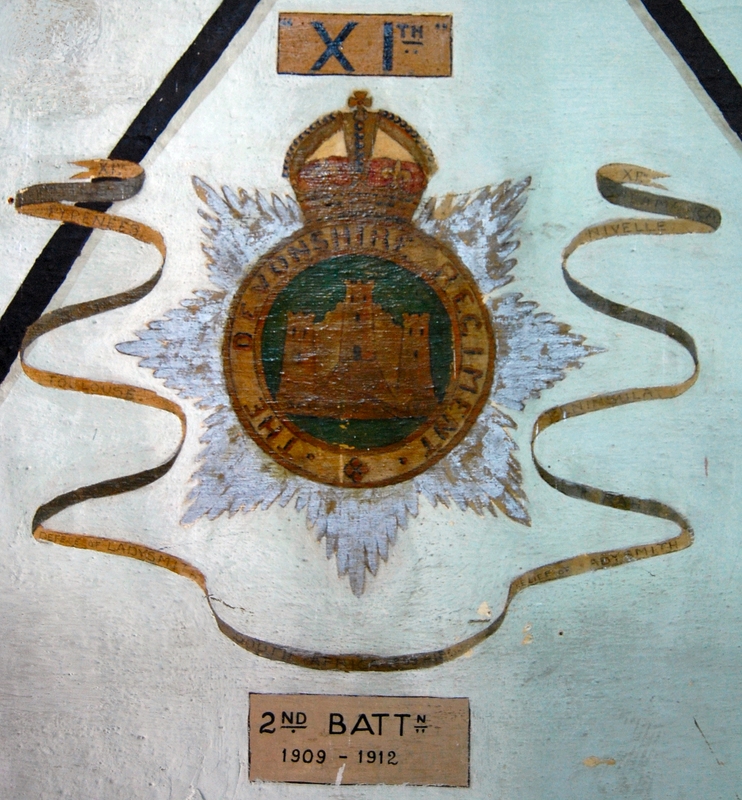 On 1 July 1881, the 11th (North Devonshire) Regiment became the Devonshire Regiment. On 17th July 1958, The Devonshire Regiment merged with The Dorset Regiment, to form The Devon and Dorset Regiment. 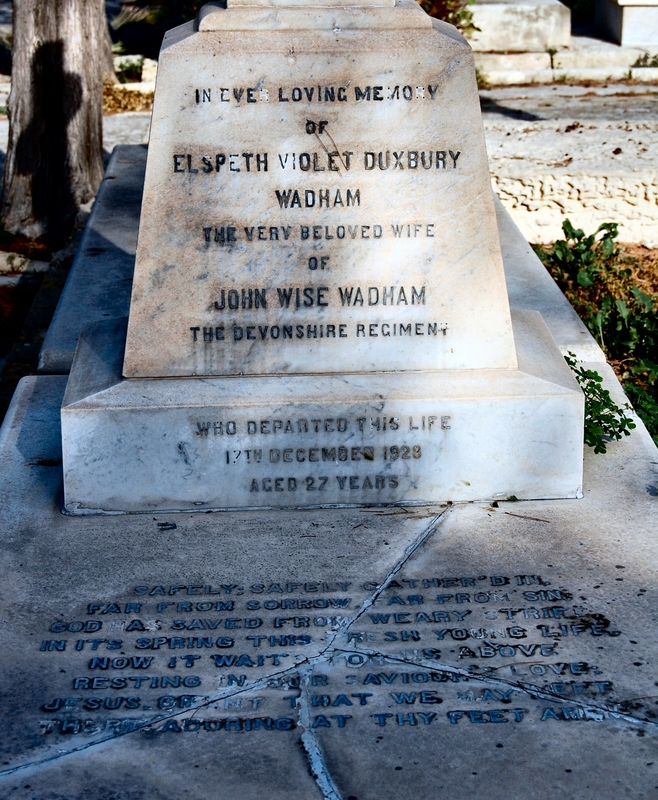 Elspeth Violet Duxbury Wadham wife of John Wise Wadham died 17 Dec 1928 aged 27 yrs. Oct 1927 The 1st/Devonshire arrived at Malta. 1 Jan 1928 Strength: 9 officers and 808 men. 1 July Strength: 26 officers and 820 men. 1 Jan 1929 Strength: 27 officers and 841 men. 1 Oct Strength: 27 officers and 882 men. 1929 The 1st/Devonshire Regiment embarked for Quetta. 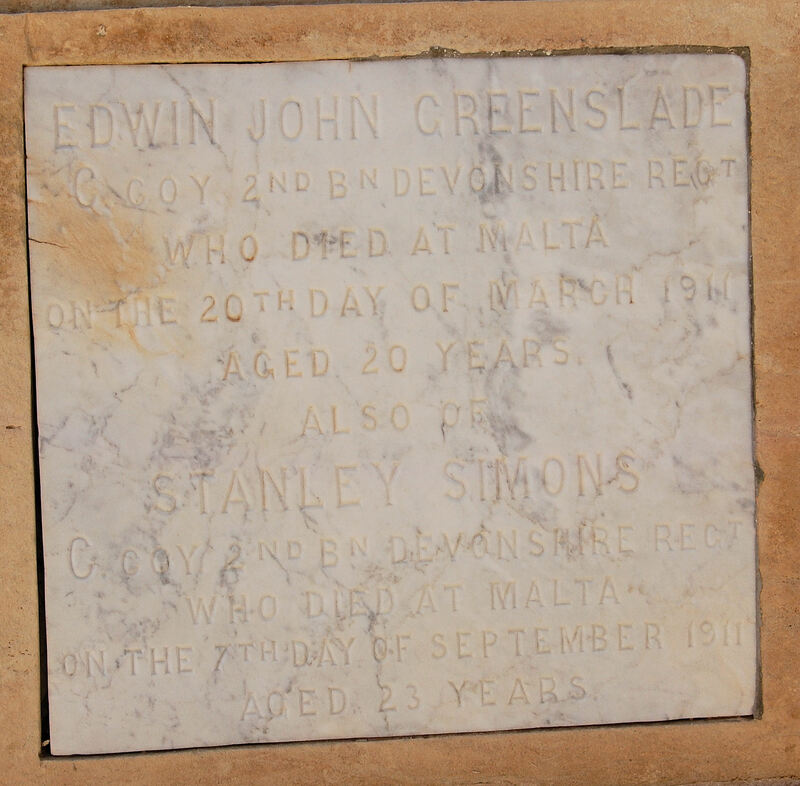 Edwind John Greenslade C Coy died 20 March 1911 Aged 20 yrs. Pte Stanley Simons C Coy died 7 Sep 1911 aged 23 yrs. 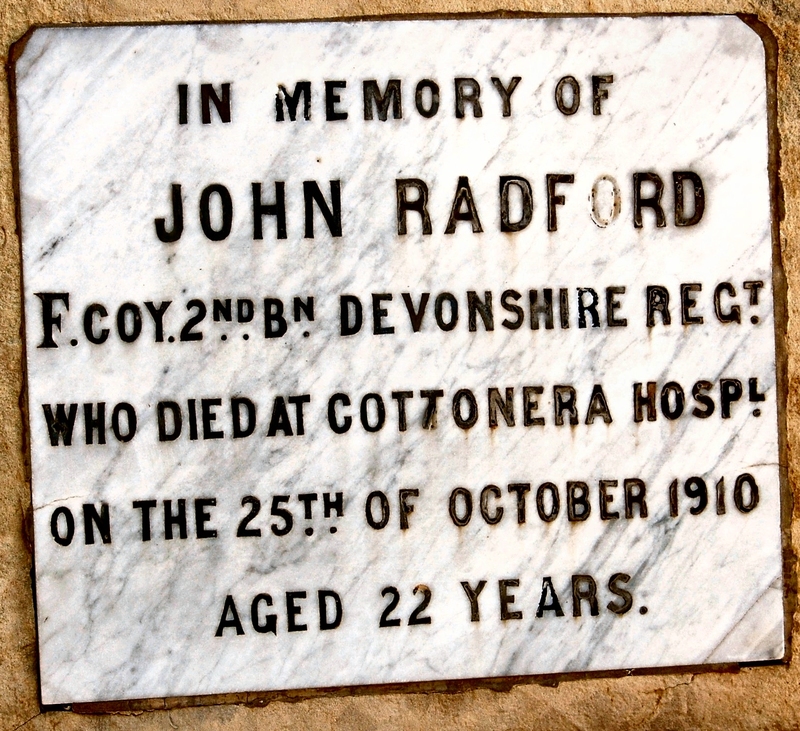 Edward John Tabb died 18 Jan 1912 aged 24 years. 28 July 1909 The 2nd/Devonshire Regiment arrived from Crete on the Rameses. 18 Jan 1912 The 2nd/Devonshire Regiment embarked for Alexandria on the Rewa. July 1938 The 2nd/Devonshire Regiment arrived at Malta. 30 June 1939 27 officers and 323 men formed a reserve in readiness at Attard. 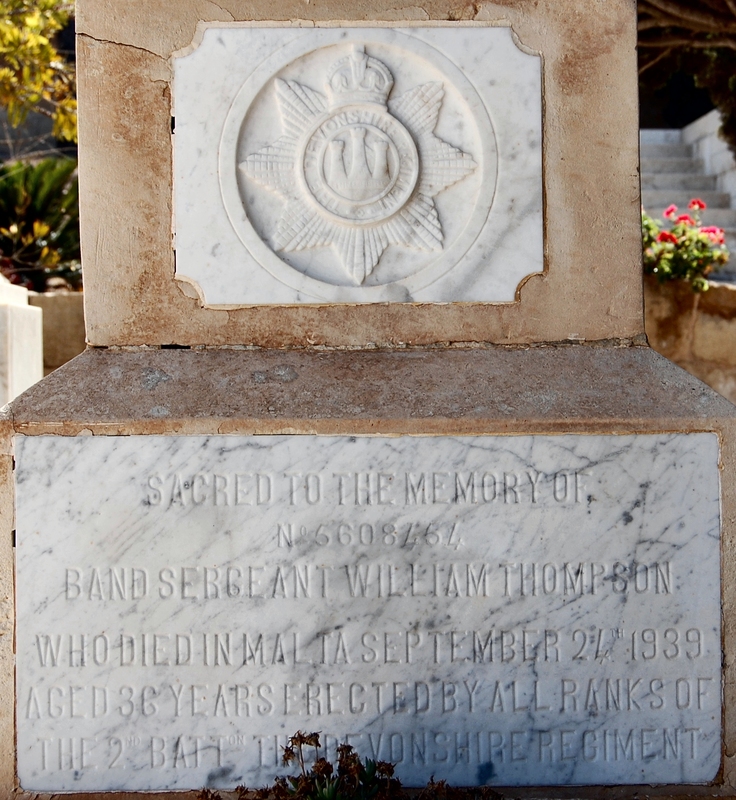 5608454 Band Sgt William Thompson died 24 Sept 1939 aged 36 yrs. 23 Jan 1940 The 2nd/Devonshire Regiment moved into St Andrews Barracks and handed over St George's Barracks and Ta' Qali to 2nd/Royal West Kent Regiment. It took over Marsaxlokk Sector from 2nd/Royal West Kent Regiment and all Passive Air Defence (PAD) responsibilities from 2nd/Royal West Kent Regiment. 30 June Strength: 24 officers and 670 men. 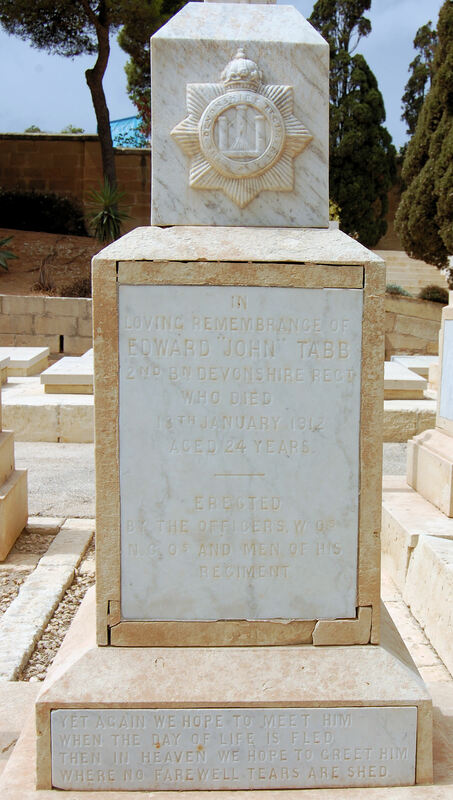 13 June During the air raid of 13 June, two casualties from 1st/Devonshire Regiment were treated at ADS Tarxien and evacuated to Mtarfa hospital. No 7342748 Pte John Henry Slade and No 5615850 Pte Henry William James Kite were killed. 29 July On 29 July, No 5619974 Pte John Henry Foote D Coy 2nd/Devonshire Regiment was accidentally shot by a private who was cleaning his rifle. 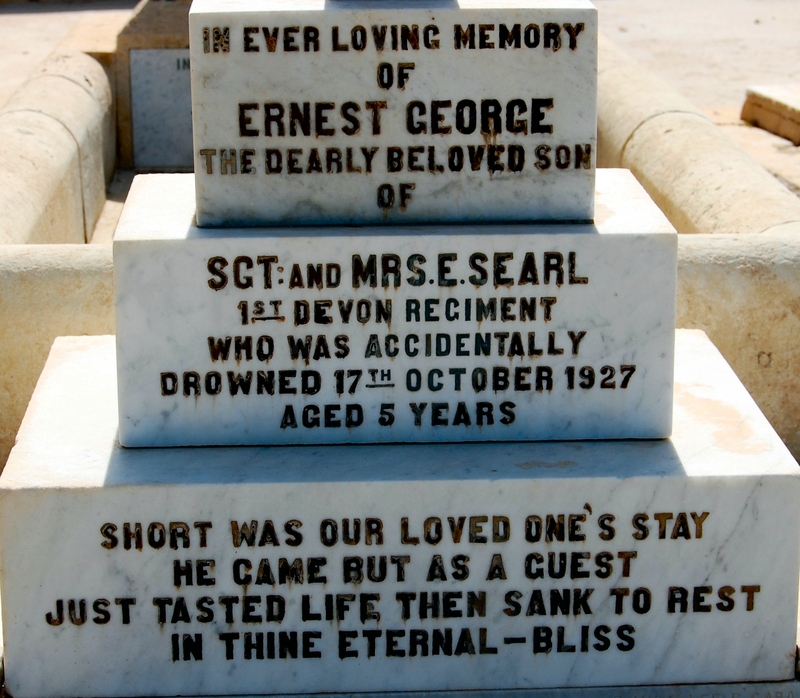 18 Dec 1940 Villa Cecy in Tarxien was handed over to 2nd/Devonshire Regiment. 30 June 1941 Strength: 30 officers and 934 men. 1943 The 2nd/Devonshire left Malta for Egypt in preparation for the invasion of Sicily. TNA:WO 379/15. Stations of Regiments 1901–1920.